A third of all seniors in the U.S. report owning a gun, and an additional 12% reside in the home of a gun owner. Bearing in mind that about 9% of those over age 65 have some form of dementia (and that number expected to more than double by the year 2050), it equates to millions of seniors with dementia living with guns. And the unpredictable states of confusion, aggression, and other difficult behaviors set the stage for potential tragedy. 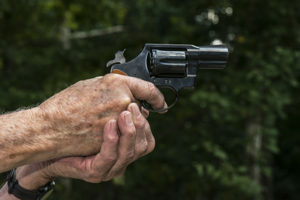 In the state of Washington alone, a government survey found that tens of thousands of seniors (54,000) reported memory decline and confusion, as well as access to weapons – and as many as 15,000 of those respondents reporting that the guns they had access to were both unlocked and loaded. In fact, in one year alone, a Kaiser Health News study uncovered more than 75 reported homicides or suicides committed by those with dementia, on top of the additional instances of guns being brandished against those closest to them – family members, neighbors, caregivers. And the suicide rate for seniors is higher than for any other age group, with guns being the most common source for senior men, according to the CDC (Centers for Disease Control and Prevention). The Alzheimer’s Association advocates for removing guns from the homes of those with dementia, but if that isn’t an option families are willing to consider, it’s important to ensure that guns are stored safely – locked, unloaded, and separate from ammunition. A little creativity can go a long way as well – for instance, replacing real guns with toy models that allow, for example, someone who was an avid hunter to safely maintain his connection to that hobby. For more tips on keeping those with dementia safe, contact the skilled dementia care team at North River Home Care. Our fully trained and experienced caregivers are adept in helping to manage some of the more challenging aspects of dementia, and in determining when a senior may be in crisis and requires medical assistance. Our dementia respite care services allow family caregivers the opportunity to rest and recharge, knowing their loved one is in capable and caring hands. Call us at 781.659.1366 or contact us online to learn more.